The climate is changing—in Canada and throughout the world. Globally, international assessments continue to identify rising air and ocean temperatures, shifting precipitation patterns, shrinking glaciers, declining snow cover and sea ice extent, rising sea level and changes in extreme events (IPCC, 2013). While rates of change vary from one indicator to another, the directions of change are consistent with climate warming, and climate models project that many of the observed trends will continue over the coming decades and beyond. 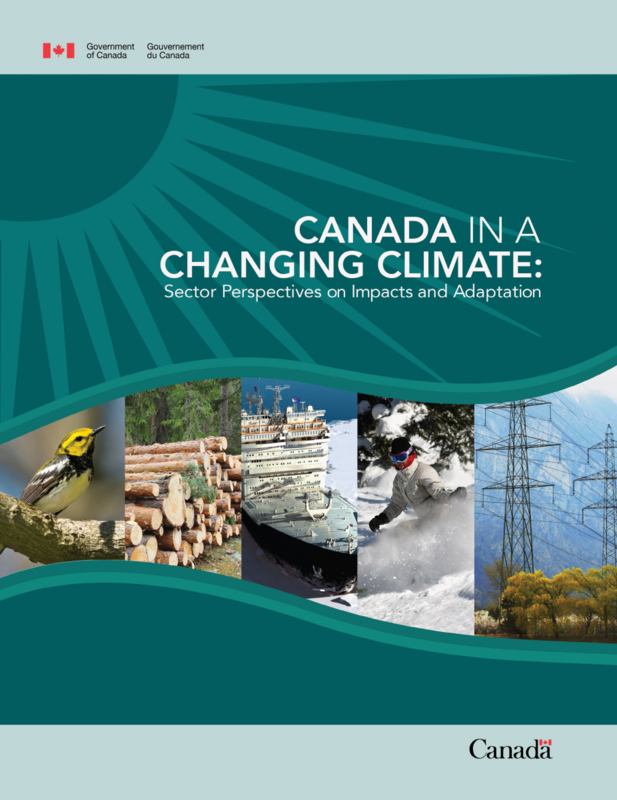 ‘Canada in a Changing Climate: Sector Perspectives on Impacts and Adaptation’ is a science assessment that synthesizes over 1500 publications to provide an up-to-date picture of climate change impacts and adaptation across key Canadian sectors. The report includes a chapter on Canada’s changing climate, six sectoral chapters (Chapter 3: Natural Resources, Chapter 4: Food Production, Chapter 5: Industry, Chapter 6: Health, Chapter 7: Biodiversity and Protected Areas, and Chapter 8: Water and Transportation Infrastructure), and a final chapter (Chapter 9) on linking research and practice in adaptation. Case studies are used throughout the report to highlight advances in adaptation. Download the full text from the right-hand column. Key lessons learnt and summaries of each of the chapters can be found below. See the full text for much more detail. Changes in the climate system and associated impacts on both natural and human systems are occurring in Canada. As a result, the need to adapt is increasingly recognized and acted upon by governments, industry and other organizations. Over the past five years, our understanding of the adaptation process has improved and examples of adaptation implementation have grown. We have seen broadened engagement on the issue, and changes being made to policies, plans and practices to increase resilience to climate change. Further adaptation is necessary to complement mitigation in helping to prevent and reduce future impacts, as well as to take advantage of potential opportunities. We now have the awareness and capacity to adapt in many cases; translating this to action will require continued collaborative efforts to reduce barriers, overcome challenges and enhance motivation to adapt. Canada’s climate is changing, with observed changes in air temperature, precipitation, snow and ice cover and other indicators. Further changes in climate are inevitable (Chapter 2). Changes in climate are increasingly affecting Canada’s natural environment, economic sectors and the health of Canadians (Chapters 3 to 8). Extreme weather events are a key concern for Canada (Chapters 3 to 8) and there is growing confidence that some types of extreme events will increase in frequency and/or intensity as the climate continues to warm (Chapter 2). Adaptation is accepted as a necessary response to climate change. It enhances the social and economic resilience of Canadians to climate change impacts (Chapters 3 to 9). Adaptation is occurring with increasing frequency and enhanced engagement. Continued action will help to build capacity, address information needs and overcome challenges (Chapters 3 to 9). Adaptation can sometimes turn risks into opportunities, and opportunities into benefits (Chapters 3 to 9). Collaboration and adaptive management are approaches that governments and industry are increasingly pursuing to advance adaptation (Chapter 9). Climate change will exacerbate existing climate risks related to the planning and management of natural resources. These risks relate to impacts and natural hazards associated with climate extremes (e.g., heat, cold, precipitation) and to gradual changes, such as permafrost degradation, sea level rise, and plant species migration. Climate change will also present new opportunities for the natural resource sectors, particularly in relation to northern economic development. Consideration of multiple stressors is critical to understanding adaptation in the natural resource sectors. Climate change itself is rarely identified as a priority concern, with industry focused on other immediate stressors, such as economic drivers. Opportunities exist to integrate consideration of climate change into current planning processes. Environmental assessment, risk disclosure, and sustainable forest management reporting are examples of processes that can help advance adaptation actions. These processes allow governments, investors, and the public to evaluate industry understanding of changing climate risks and influence the steps taken to address those risks. While awareness of climate change impacts and implementation of adaptation actions is most evident in sectors, where there is a clear and direct relationship between climate and resource supply, notably forestry and hydroelectricity, the application of adaptive management approaches to address climate change impacts is seen across all natural resource sectors. The impacts of climate change differ significantly between agriculture, fisheries, and non-commercial food supply, but common challenges include increased losses from invasive pests and diseases, and risks to transportation systems upon which the sectors rely. The net medium-term outlook is for a likely modest increase in agricultural food production. Longer and warmer growing seasons would allow higher-value warmer-weather crops to be grown further north (where soil conditions permit), lengthen outdoor feeding seasons for livestock, and allow the maple syrup industry to expand northward. However, there will likely be new pests and diseases, as well as more severe outbreaks of current ones, and challenges associated with extreme weather events and the reduced predictability of inter-annual weather variability that could negatively affect production. Northern and remote communities are likely to see great changes in their environment – some will ease food security concerns, while others could exacerbate already decreasing country food stocks and difficulties in delivering supplies into isolated areas. Canada is expected to remain a net exporter of aquatic foods at the aggregate level, with total biomass of production from wild, capture fisheries in Canada expected to increase due to climate-induced shifts in fish distributions. Regional impacts from invading species, physical habitat changes and societal responses to shift sin availability and access to aquatic food resources will gradually determine future patterns of use and overall economic implications. Aquaculture has a greater scope for adaptation to climate change than other fisheries, making it less vulnerable and better positioned to take advantage of opportunities than capture fisheries, and subsistence fisheries in particular. Industrial activity is sensitive to variations in weather and in extreme events, with considerable differences in the types and extent of impacts on production, operations, and revenue among and within sectors. Changes in industry practices have been predominantly reactive, responding to variation in the weather or extreme events, rather than proactive anticipation of future climate change. Examples of adaptation tend to be isolated rather than representative of a clear trend within the sector. Adaptive actions implemented by industry vary by sector, and may be under-reported for strategic reasons. Relative to other sectors, tourism and insurance show the most promise in using adaptive actions to take advantage of potential opportunities. There is little published research about indirect impacts of climate change on industry, such as changes associated with consumer demand, supply chains, real estate or other assets, adaptation by other sectors, legal liability or government regulation. Barriers towards effective adaptation include limited information on local impacts to businesses, uncertainties about the costs and benefits of different adaptive actions, and limited market demand for the implementation of adaptation. Climate-related shifts in species distributions have already been documented for plants and animals in Canada. In many locations, differential range shifts among species are likely to result in novel ecosystems that have different species assemblages, structural attributes, and ecological functions than existing ones. For some species, the current and projected rates of environmental change exceed their natural ability to adapt, increasing stress and threatening biodiversity. As a result, climate change is magnifying the importance of managing ecosystems in a manner that enhances resilience and preserves biodiversity. Protected areas, including parks, wildlife reserves and marine protected areas will play an important role in the conservation of biodiversity by providing “refuge” or migration corridors for native species, helping to maintain genetic diversity. Many Canadian jurisdictions are expanding their parks and protected area systems as part of their overall management plans and climate change adaptation strategies. Associated research, monitoring, citizen science, public awareness, and visitor experience programs build understanding, engage the public and help them contribute to meaningful participatory decision-making. Ecological restoration can strengthen resilience to climate change. Integration of climate change adaptation strategies into restoration decision-making in Canada, as elsewhere, is complex. Stronger evidence has emerged since 2008 of the wide range of health risks to Canadians posed by a changing climate. For example, climate-sensitive diseases (e.g. Lyme disease) and vectors are moving northward into Canada and will likely continue to expand their range. In addition, new research suggests climate change will exacerbate air pollution issues in some parts of Canada, although further reductions in air contaminant emissions could offset climate-related changes to ground-level ozone and particulate matter concentrations. A range of climate-related natural hazards continues to impact communities, presenting increasing risks to future health. Recent flood and wildfire events have severely impacted communities through destruction of infrastructure and displacement of populations. Many adaptation activities are being taken from local to national levels to help Canadians prepare for the health impacts of climate change. Adaptation planning considers the underlying causes of health vulnerability, which differ across urban, rural, coastal and Northern communities. Provincial, territorial, and local health authorities are gaining an increasing knowledge of climate change and health vulnerabilities through assessments and targeted research, and some jurisdictions have begun mainstreaming climate change considerations into existing health policies and programs. Efforts to increase public awareness about how to reduce climate-related health risks are also evident. Adaptation tools and measures, such as heat alert and response systems, projections of vector-borne disease expansion and greening urban environments can help protect Canadians from the effects of climate change being felt now, and those from future impacts. Well-maintained infrastructure is more resilient to a changing climate. This is especially true with respect to gradual changes in temperature and precipitation patterns. Key vulnerabilities are associated with the impacts of extreme weather events, which can overwhelm the capacity of water infrastructure. Over the past five years, the work of the Public Infrastructure Engineering Vulnerability Committee (PIEVC) has been an important driver of progress on understanding how to adapt Canada’s infrastructure to climate change. The broadly applicable, risk-based assessment protocol developed by the PIEVC allows engineers and planners to view and address climate change as one factor among many affecting system resiliency, and plan accordingly. Consideration of climate change as an element of adaptive asset management encourages consideration of climate factors as part of ongoing system monitoring, and informs decisions regarding the most cost-effective approaches for infrastructure design, operation and maintenance. Codes, standards and related instruments (CSRI) are recognized as a potentially important driver of infrastructure adaptation, but there are few examples of CSRIs in Canada that considered historic changes or projected future changes in climate when they were developed. Further assessment of current and future climate-related risks to infrastructure systems would help to inform appropriate adjustments to design codes and standards for addressing future climate. Adaptation is being undertaken in Canada to achieve a range of goals, such as increasing capacity to adapt, improving resilience to specific climate events (especially extremes), and enhancing ability to deal with different climate conditions. Among sectors, those with a demonstrated high sensitivity and exposure to climate and weather are generally most active in taking steps to understand, assess and manage vulnerability and risk related to climate change. Adaptation is not solely a local issue, although examples from the municipal level still appear to dominate. There are examples of action by all levels of government, as well as community groups and industry, many of which represent collaborative initiatives. Understanding of the barriers and challenges to adaptation has improved, with recognition that factors beyond the basic determinants of adaptive capacity need to be addressed. As a result, understanding of how to overcome key barriers and enable adaptation has improved. Adaptation implementation in Canada is still in its early stages. Planning and policy exercises, and efforts to build capacity and raise awareness comprise much of the adaptation action documented, with relatively few documented examples of implementation of specific changes to reduce vulnerability to future climate change, or take advantage of potential opportunities. Several factors can help accelerate the transition between awareness and action, including leadership, targeted awareness-raising and supportive strategies or policies. Experiencing extreme weather events, as well as observing impacts of gradual changes (e.g. sea level rise) also stimulates adaptation. Warren, F.J. and Lemmen, D.S., editors (2014): Canada in a Changing Climate: Sector Perspectives on Impacts and Adaptation; Government of Canada, Ottawa, ON, 286p.